Hey, honey, I miss you, and I can’t wait to see you when we finally get back. I’m having a lot of fun here, but I wish you could have come with us. This trinary system is more interesting than we thought. We went to this one world that you are not going to believe. The scientists gave us this long-winded explanation that I couldn’t follow. She said something about the temperature of the planet, and the composition of the atmosphere. She hypothesized that the ocean didn’t form like this exactly naturally, but somehow transformed from fermentation brought upon by evolutionary fascinating microorganisms that she can only postulate exist. She wanted to stay and study the phenomenon more, but it was a pretty hostile environment, and we weren’t really equipped for a long term survey. Besides, there weren’t any resources, so it wasn’t like we would have gotten much out of it. She was allowed to take a few samples back to the ship, though, so maybe we’ll learn a thing or two about how the universe works. I wanted to take a few samples of my own, because I think it’s cool that that we found an ocean made of alcohol, but the captain ordered us to stay away from it. I imagine she’s worried I’m going to try and drink it, which would be outrageous, but I understand where she’s coming from. So we moved on. The next planet we came to—the one we’re still orbiting right now—showed unusually specific signs of civilization. We found no ruins, nor any ancient artifacts. There weren’t any petrified specimens, or bones. We only know that someone must have been there at some point, whether it was that species’ home planet, or not. We only found a single structure on the entire surface, or underneath at a depth of fifty kilometers, so we guessed it served as some alien outpost at one point. The rest of it appeared to be completely untouched by anything beyond some weird plantlife. There were computers and other instruments in the structure. They allowed us to not only control the weather, but also the composition of the atmosphere. We turned up the oxygen to help us breathe a little easier, but there is still so much to learn. Oh my God. Oh my God, sweetie, that’s it. How did we not think of this before? We need to move these machines over to the alcohol ocean planet. 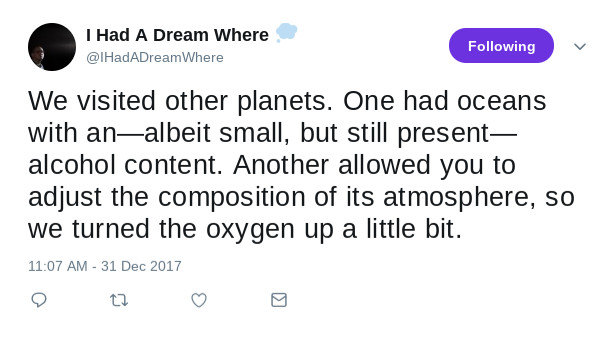 That’s the one with an atmosphere that needs to be adjusted. Okay, I gotta go, but I’ll send you another message tomorrow. Love you, don’t cheat on me!